There is one page of sounds-in-isolation tic-tac-toe practice sheets for each of the following phonemes: /b, ch, d, f, g, h, j, k, l, m, n, p, r, s, sh, t, th, v, w, y, z/. 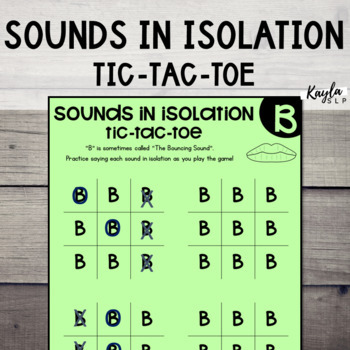 Play tic-tac-toe while practicing sounds in isolation. 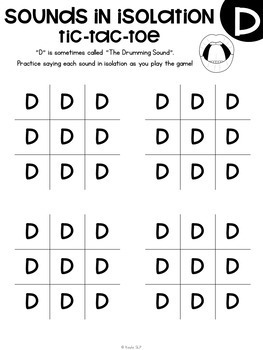 Say each sound 1, 5, or 10 times as you take your turn in tic-tac-toe. 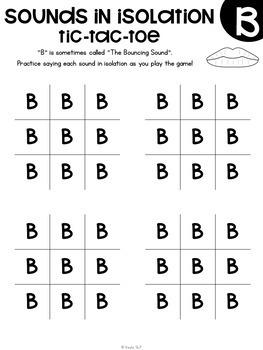 Place in a page protector and play over and over again!